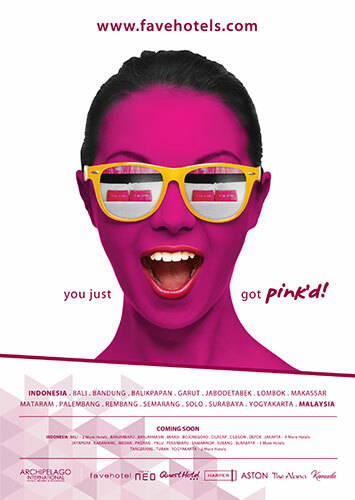 Jakarta, November 20 2015 – favehotel, Archipelago International's wildly popular budget brand, recently launched its new "Get Pink'd" ad campaign. It immediately takes over social media as their followers begin changing profile pictures to make themselves look like the fave girl seen in the ad. The hotel chain is sponsoring a giveaway where its fans not only have a chance to win a free stay but also a chance to be featured in the cinema XXI movie preview for the world's biggest films coming in December. The new ads highlight the brand's fun side by showcasing a super fan who has just checked into a favehotel and has been immediately transformed by the experience. Her skin is a glowing pink color, radiating a surprised happy face, and glasses reflecting the signature fave pillows on the bed in the room. favehotel's core audience is predominately young millennials, one of the fastest growing age segments for the world's tourism. This booming market enjoys traveling, chasing unique experiences, and good at bargaining. favehotels aim to give them all those things in a fun pink"d theme package. Spearheaded by Archipelago International's newest Vice President of Sales & Marketing, a young Millennial herself, Tenaiya Brookfield added, "We wanted to create a campaign that spoke to our biggest fans and supporters, those who absolutely love favehotels. When we originally created the brand name fave, we envisioned it would be an English slang version of saying 'my favorite' or 'my fave' hotel in each city. Now we can give back to those who made us their favorite, with a fun campaign they can join and take part in." Now in 2015, favehotel has operated 36 hotels throughout Indonesia and Malaysia including 12 in Jakarta and 5 in Bali, with an upcoming development pipeline of more than 40 hotels set to open at major cities across Indonesia, Malaysia and the Philippines. For the best price guarantee you can visit the brand's website at www.favehotels.com as well as the favehotel Facebook Page to check out the latest “Get Pink'd” offers.